- fly fishing for brown trout, salmon and sea trout. 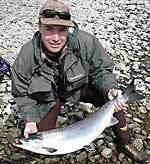 Scottish salmon rivers are well known wherever salmon anglers meet. Tay, Dee, Ness, Spey, Tweed, Helmsdale to name but a few are part of an international fishing language, words associated with prolific salmon runs, classic salmon flies and a number of fishing techniques that have stood the test of time such as Greased Line, Spey casting and backing up. Couple Scotland's fishing opportunities with this fantastic heritage, add whisky and fine people and you have the recipe for enjoyment, challenge and with a bit of luck, success. If that were not enough and truth be told salmon fishing is only a fraction of what Scotland can offer the fly fisherman, for this land also teems with brown trout. Wild. feisty brown trout, large and small, bright and dark a plenitude of spotty piscatorial beauties in multitudes of rivers and lochs. Deep in the large lochs lie double figure trout, in the rivers good quality wild trout between 10 and 18 inches are plentiful and in the mountain lochs seldom fished who knows what lurks beneath the dancing waves? There is a common misconception that salmon fishing in Scotland is hard to come by, no doubt borne out by the high rents and scarce access to many of the famous beats in peak season. However, with experience and flexibility, knowing the conditions and the fish well it is possible to take advantage of good fishing opportunities when they occur, especially if you have keen professional assistance and all the necessary gear to hand. www.letsflyfish.com can help by arranging fishing, instruction and packages and giving you an honest assessment of prospects. Ally is familiar with the rivers of Scotland and will try to match your requirements to the best chances. If requested he will provide fishing instruction and tactical advice to give you the benefit of his enormous experience of salmon and trout fishing, a service that has gives an insight into how the expert angler thinks like a fish, reads water like a book and has the uncanny knack of coming up trumps. Even on a blank day most anglers will learn a huge amount about fishing, techniques and the fish. Trout fishing on many of the Scottish rivers is excellent value and challenging. The average price of a day's fishing is around £5, about the same as a dram of good malt whisky, but of course the fishing lasts 24 hours and you can use as much water as you like without spoiling it! Loch fishing from boats is slightly more expensive because the boat has to be hired. Costs vary between £15 and £40 for two or three anglers which still represents excellent value. For lots of information about fishing in Scotland go to www.flyfish-scotland.com. For enquiries about fishing in Scotland please contact me by e-mail or phone +44 (0) 1796 473718. The zero in brackets must be used instead of the international code for calls within UK, it must not be used from international addresses.